There aren’t many places on Earth where hawksbill turtles feel so unthreatened that they come ashore in broad daylight to lay their eggs. 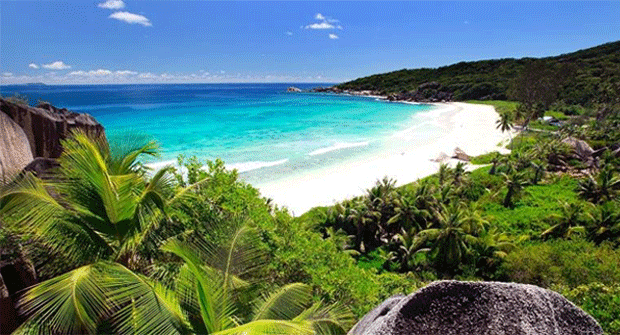 The Seychelles is one place where they do. There she was: a turtle scooping a hole in the sand, then entering the trance that accompanies the egg-laying process. Her carapace swayed as lychee-like ova plopped into the hollow. Erin, the ecologist with me on the beach, measured the turtle’s shell and checked her tags. The only sounds I could make out were the turtle shuffling leaves, and the whisper of the warm breeze. Half an hour slid by before I moved from my supine position at the back of the beach to dust myself free of fine, white sand. Many of the turtle’s progeny will not survive; only around one in every 1,000 sea turtles makes it to adulthood. In most parts of the world turtles use the cover of darkness for protection as they lay and hatch their eggs – an attempt to address those odds. But in the Seychelles, quiet, protected beaches surrounded by indigenous forest allow them a degree of safety, even in daylight. According to one estimate from the Marine Conservation Society Seychelles (MCSS), 191 nests across 14 beaches had been recorded three quarters of the way through the 2015-16 nesting season. With some exceptions, development and conservation sit together well in this archipelago of 115 islands. One coastline on the mainland, Mahé, aside, buildings cede to vegetation. Awareness of the need to preserve island ecology is increasing. Indigenous animal species that have been adversely affected by human development patterns are being reintroduced. I was staying at the Fregate Island Private, 20 minutes by helicopter from Mahé. The resort is certainly luxurious. But as well as private infinity pools and a platoon of butlers, it provides access to some of the world’s rarest fauna and flora, so the need to preserve habitats and landscapes is fundamental. Fregate was taken over in 2013 by the Oetker Collection, which also owns luxury properties in Paris and Marrakesh. When the new owners finished a refurbishment of the 16 villas last summer, they introduced fuel-efficient energy generators and a new wastewater conversion system for irrigation. Almost all the fruit and vegetables needed for the restaurant are grown on the island. Some are produced in hydroponic greenhouses, while outside chillies, pineapples and purple basil blossom. Fregate’s best-documented conservation success has been the return of the magpie robin, which 30 years ago was the world’s second-rarest bird, with only 14 specimens remaining on Earth. Now there are more than 100; a common sight. Other vulnerable birds are flourishing too – the endemic Seychelles white eye and Seychelles warbler, for example, and the dashing, silky blue pigeon. The giant millipede population has an alarming penchant for 8pm conventions on the pavements between villas and the restaurant. But without them, Fregate would not be the luxurious cocoon it is; it would, in fact, be covered in rotting leaves. These harmless mini-beasts are responsible for composting a third of the fallen vegetation on the island – and knowing that, it is much easier to see the charm in their 256 legs. Meanwhile, the 2,200 giant Aldabra tortoises that roam free here provide gentle distraction of their own. It has taken time to restore Fregate to its current state. Indeed, the Seychelles as a whole suffered centuries of abuse by colonisers, pirates and unsustainable farming. At the hands of European settlers, indigenous trees such as the badamier and “kapesin” – so called because of its seed resembling a monk’s hood – were destroyed, in favour of cinnamon and coconut plantations for their value to the spice trade and in shipbuilding. When the British took control of the islands from the French in 1814, sea turtles were increasingly killed for their meat and shells, while pirates would store the giant tortoises on their ships, to provide fresh meat on long voyages. On the myriad trekking trails that cross Mahé, the scent of cinnamon still hangs in the air, vying with the whiff of ylang-ylang and lemon grass. Terence, my guide, said that there were efforts to remove the rampant spice plants, but it was an ongoing battle. There is a careful path to tread over on Praslin, too, a squiggle of an island which is home to forests of coco de mer palm, unique to the Seychelles. Its beaches are also important turtle breeding sites. On the long, languid stretch of sand at Grand Anse Kerlan – bashed by rather less languid waves – guests from the neighbouring Constance Lemuria resort are taught how to recognise a nesting turtle, and are invited to witness – but not interfere with – the hatchlings as they beetle their way to shore. The NGO Nature Seychelles also protects the delightfully named Cousin Island (neighbouring Cousine is a private resort) as a nature reserve. For humans, especially those without insect repellent, it can be a less than pleasant, sweaty and soily experience – but interesting nevertheless, though you would not want to linger for more than an hour or so. For ground-nesting fairy terns, and the all-important millipedes, though, it is a place to thrive. 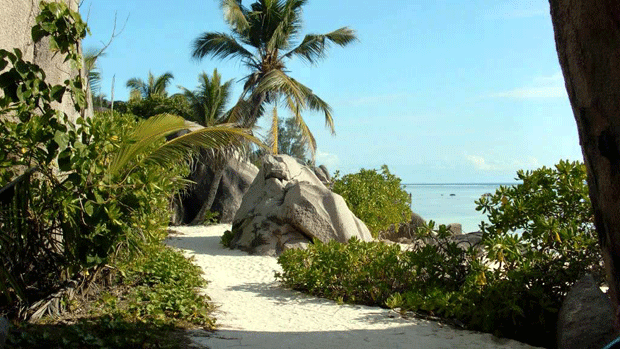 It was on the teardrop-shaped La Digue that small-island living became smaller-island repose. Home to just 2,700 people, it was first recorded by French explorer Marion Dufresne in 1768 and remains mostly undeveloped. There are no large hotels; people get around by bike or golf buggy. I wandered along one of the few roads that curve around the island, flanked by Creole houses with verandas and orange roofs piquant against lush walls of greenery.